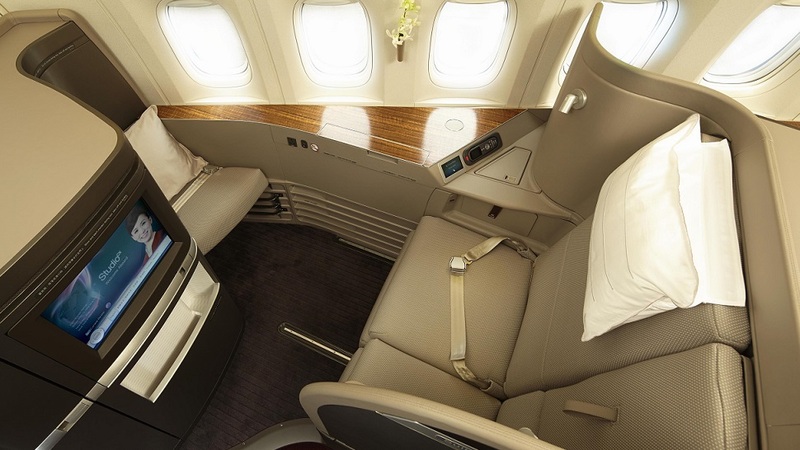 Today (September 1, 2014): Top 10: best First Class suites in the sky. Due to the race to improve Business Class, First Class is a slowly dying breed. Some airlines have dropped it entirely, while others only offer it on “high-yield” routes with heavy business traffic and enough people that are willing to pay for the privilege (e.g. New York to London). First Class is, amongst others, known for superb ground service (with limo transfers and dedicated lounges) as well as superlative meal service, including high-quality champagne, lobster tail and caviar. While a lie-flat seat is a standard amenity in modern First Class, most top airlines now offer it in suite configuration. I hereby present you my selection of the 10 most luxurious First Class suites in the sky. There is more info below the slide show. Think I missed one? Share your favorite First Class product in the comments section, or take my poll below! With Garuda Indonesia, you can now indulge yourself in all the warmth and graciousness for which Indonesia is renowned. Inside Garuda Indonesia’s new Boeing 777-300ER, eight luxurious private First Class suites with a 1-2-1 configuration await you. The newly designed suites are peaceful sanctuaries that will make you forget that you are sailing high above the clouds. The wide and ergonomic seats turn into a luxurious full-flat bed with mattress, duvet, pillows and equipped with an ottoman. Let’s not forget the dining options that Garuda Indonesia offers: you can enjoy the finest culinary delights, served by Chef-on-board, and handpicked from world-renowned restaurants. Oman Air offers an unmatched level of luxury for its premium class passengers including lie-flat seats, direct aisle access and a la carte dining for every passenger in First Class. With just six seats within the first class cabin, together with a luxurious lounge area, the passenger experience is akin to flying in an exclusive private jet. 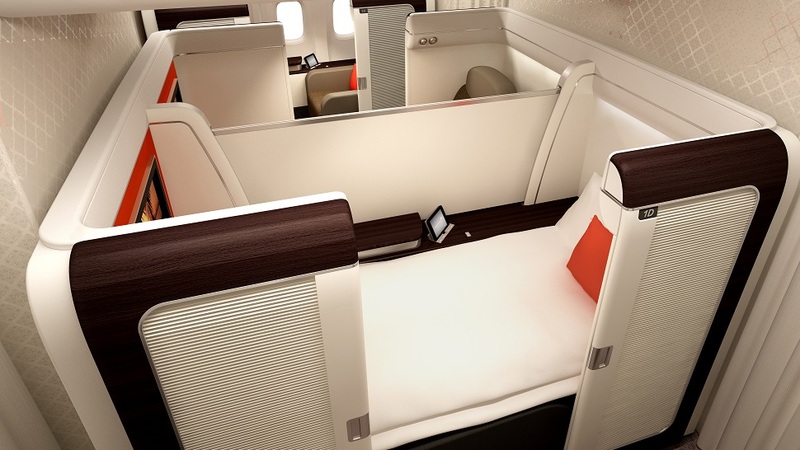 The First Class Mini Suite offers the longest lie-flat seat available on any commercial airliner and is set within a massive 87-inch pitch. Furthermore, with a 25.5-inch wide seat, and eight point massage system built-in, stowage for hand luggage, dedicated space to hang a coat and a huge 23-inch (58 cm) video monitor, Oman Air’s First Class Mini Suite is in a class of its own. The ANA First Class square cabin has been cleverly designed to provide the ultimate space, privacy, and comfort: upon arrival in your nearly-enclosed private suite, you can place your jacket and shoes in cleverly designed storage compartments fitted to the wall of each individual cabin. The high-panel walls are furnished in contemporary wood tones for both the exterior and interior. All first class seats are fitted with a 23-inch (58 cm) LCD touch panel. ANA entertain it’s First Class guest’s taste buds with the best of seasonal delicacies in Japanese Kaiseki style or with elegantly crafted Modern European dishes. 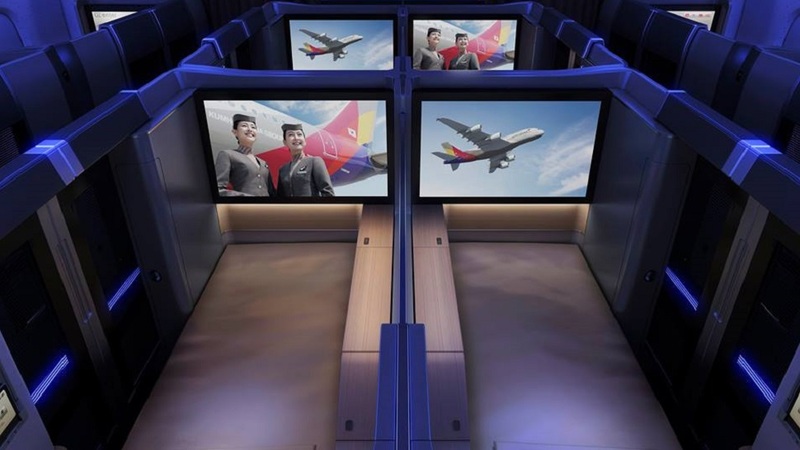 Asiana maximizes the in-flight privacy of its First Class passengers by providing seats with two sliding doors, the First Suite of its kind to be offered by a Korean airline: close the sliding doors, and the seat turns into your own private space. The full flat-bed stretching 82 inch (210 cm) in length is equipped with the world’s largest 32 inch (81 cm) HD personal monitor, guaranteeing an unrivaled viewing experience. Mood lightning optimizes lighting conditions for take-off, meals, sleeping and rest, and the Star Light system provides a special in-flight sleeping experience under the stars in the sky. You can also enjoy the company of your travel companion within your suite with an extra seat in front of you. Priestman Goode, the London-based design consultancy firm, has designed the First Class suite of Swiss International Air Lines. It is a very ‘Swiss’ product, with lots of lovely blond wood, cotton bedding and square edges. The seat can be turned into a lounge armchair, a table for two or a bed with a mattress and privacy walls. You can adjust the integrated air cushions to suit your individual requirements. While the seats are incredibly comfortable, the food is the highlight: in Swiss’ First Class, you will dine as if you were in a gourmet restaurant. If you value privacy and personalised service above all else, you’ll love Emirates’ First Class private suites. Each suite comes fully equipped with a sliding door, a personal mini-bar, adjustable ambient lighting, and its own vanity table, mirror, wardrobe, and privacy divider for central suites. And if you want to stretch out and sleep, the crew will convert your seat to a fully flat-bed with a mattress, so you can arrive at your destination totally refreshed. 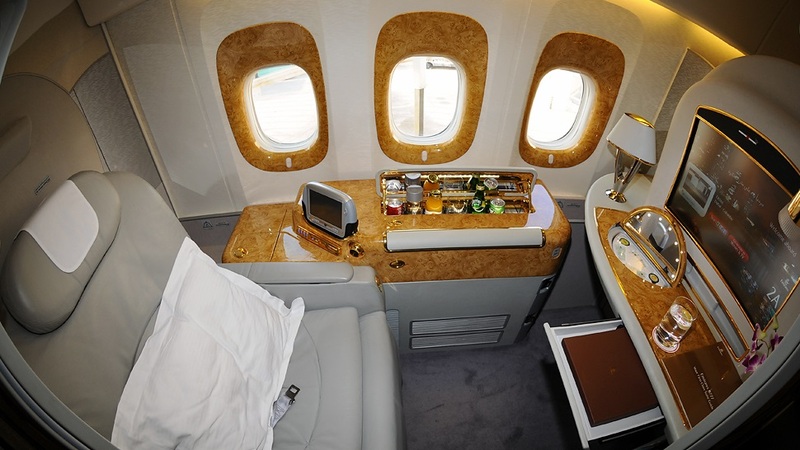 First Class private suites are available on all Emirates Airbus A380 and A340-500 aircraft, and most Boeing 777 aircraft. 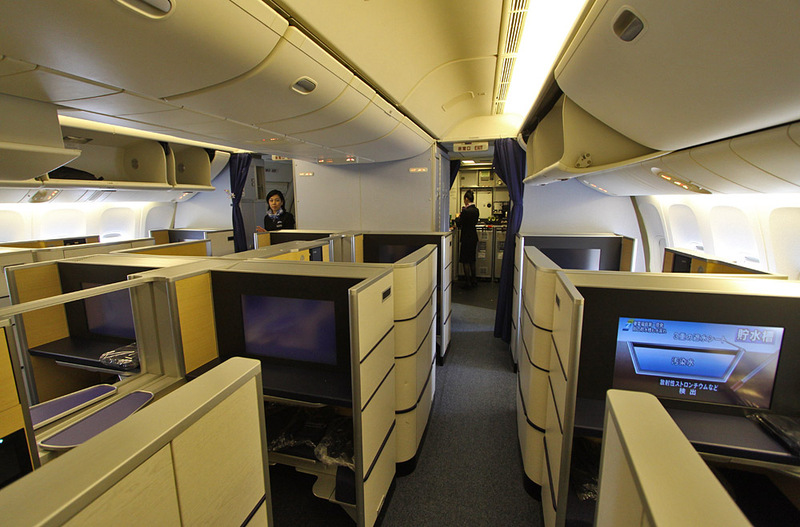 First Class cabins on other aircraft offer flat-bed seats or deeply-reclining comfort. 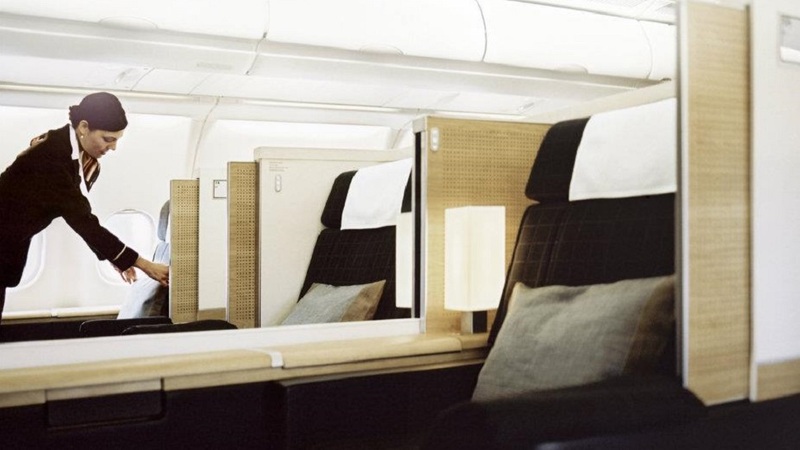 Located on the upper deck, the Lufthansa Boeing 747-400 aircraft features a unique First Class cabin with 8 seats, four rows with one on each side of the plane. Although not a genuine suite and not the newest First Class product of the airline (which you can find on the Airbus A330, Airbus A380 and Boeing 747-8), it’s a favorite of many thanks to the fact that it feels super exclusive up on the top deck, with each seat comprising a recliner (closest to the aisle) and a separate bed (located next to the window). 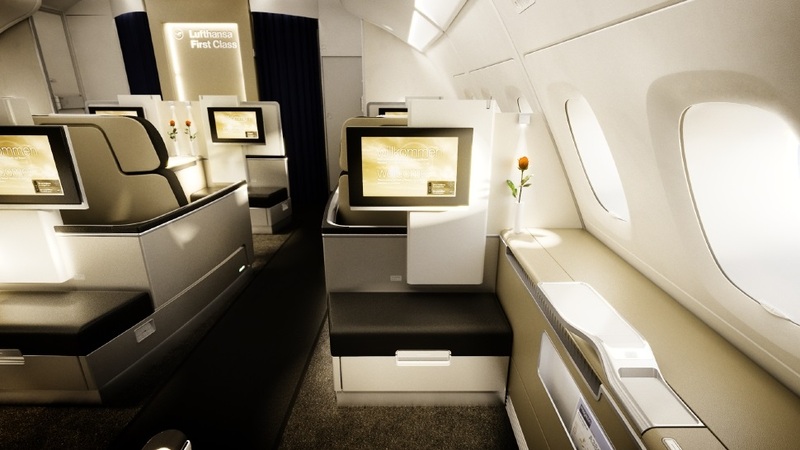 Of course the seat and bed come with Lufthansa’s famous First Class service, both in the air and on the ground. 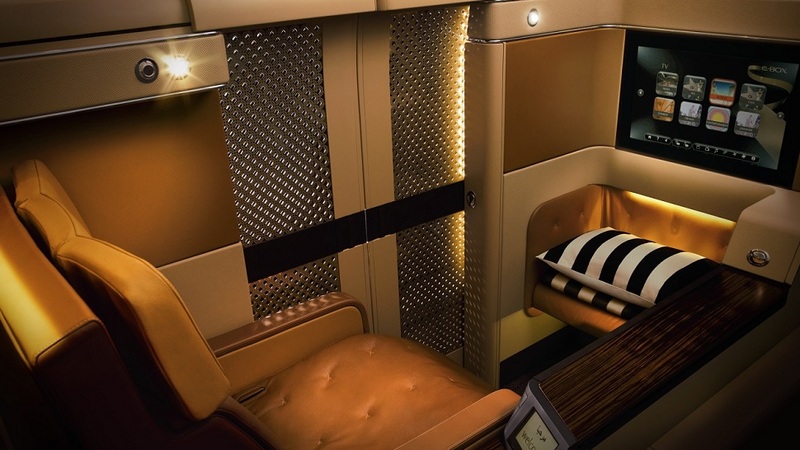 All of Etihad’s First Class Suites have sliding doors offering privacy for passengers. Seat materials are luxurious – you will love the leather quality of world-renowned manufacturer Poltrona Frau, suppliers of Ferrari’s interiors! – and come in smoothing beige and dark wood tones. The seat itself is very large and comfortable with a 78-inch (2 meter) pitch, a wide 23-inch (58 cm), and a private mini bar. For dinner, a convenient table enables to enjoy the a-la-carte dishes watching TV or let two passengers seating face to face. After dinner, you can drift into a comfortable sleep with a pure Dupion silk and cotton duvet, fitted sheet, cosy blankets and full-sized pillows. In 2015, Etihad will introduce its new First Class product on its Airbus A380 and Boeing 787, and it will be a blast. In fact, the Abu Dhabi-based carrier Etihad Airways will push luxury to a sky-high new level and beyond First Class with the unveiling of its new ‘residence’ class on board its Airbus A380 superjumbos. The three-section private cabin will feature a lounge area, a bedroom and a bathroom with shower. There will also be an onboard butler solely to service passengers in the ‘residence’, trained by the Savoy Butler Academy in London, part of the Savoy Hotel. 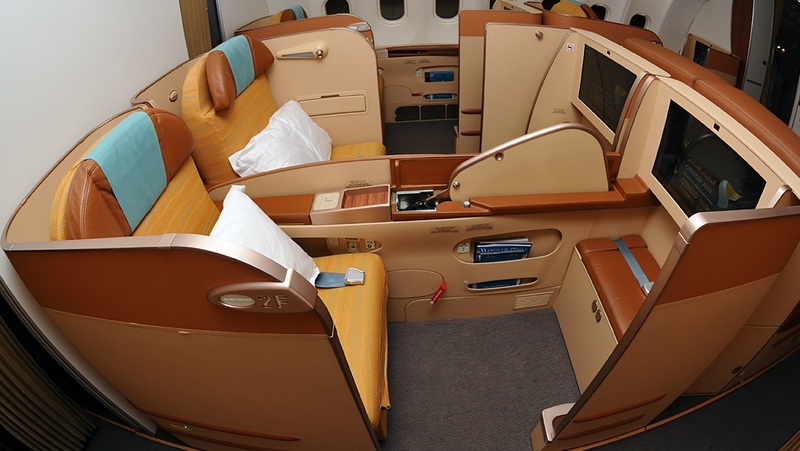 Review: read here my review of Etihad Airways’ First Class in an Airbus A380. Following the spectacular refurbishment of our their First Class Lounge at Hong Kong International Airport, Cathay Pacific extended the sophisticated, contemporary style into its First Class. The outer surface of the First Class Suite is a dark, high-gloss material, while inside, the new side console and the interior of the seat are wrapped in natural leather with subtle linings and stitching for a clean, refined, sophisticated look. Warm-toned natural leather is used extensively on most interior surfaces of the suite for a soft, luxurious feel. The seat smoothly transforms into a fully flat-bed, and the bedding comes with high-quality fabrics for the duvets, pillows, cushions and the mattress to ensure a comfortable sleep. The Singapore Airlines First Class suites, exclusively on board the Airbus A380 aircraft, provide the distinguished few with their very own haven of tranquility. You can luxuriate in your very own private space in the largest ever armchair in the sky, hand-stitched by master Italian craftsmen Poltrona Frau. Each individual cabin features sliding doors and window blinds, offering you the freedom to decide on the level of privacy you prefer. While the leather and wood finishes, created in soothing natural hues, enhance the sense of serenity. 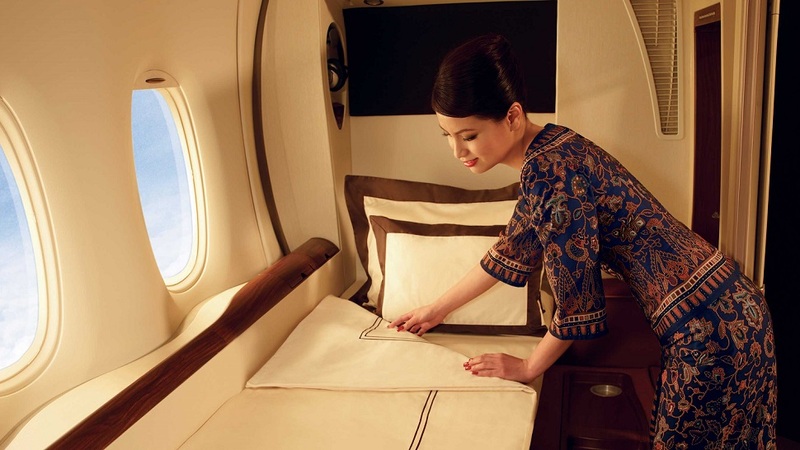 Singapore Airlines’ signature turndown service, with fine linen and plush, full-sized pillows, ensures a restful slumber. Emirates is famous, and “marketingly” very present on the web. However their first class starts to be a bit dated and used. I would prefer Etihad or even Qatar Airways which both have, moreover, stunning airport lounges. You can see reviews about them on our website. OMGr! These are ideal conditions for travel!